When you grow up surrounded by sweet corn, summers in the city can feel a little, well, salty. I can remember driving through those fields of swaying green stalks and hearing my mother say it was ‘as high as an elephant’s eye’ (just like in Oklahoma!). On balmy evenings we would gather at the patio table under the big magnolia tree in our backyard and eat plates of raw tomatoes sprinkled with salt and pepper and barely boiled sweet corn adorned with just a slick of butter. 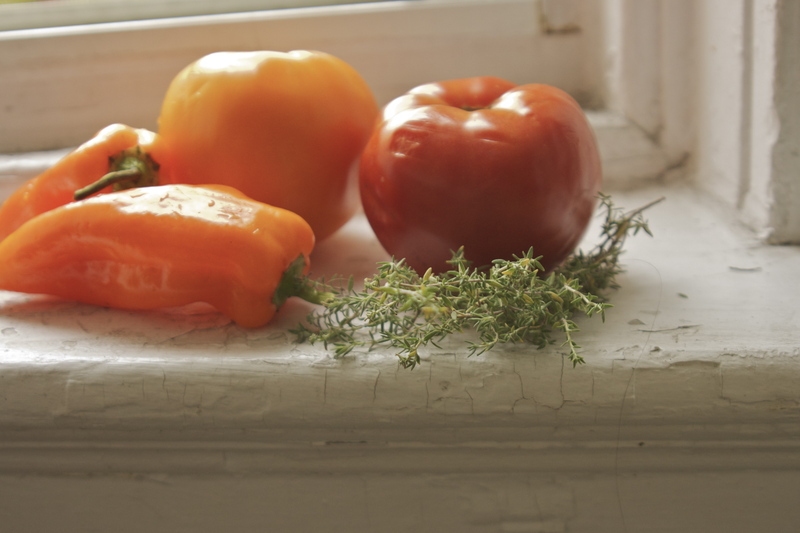 It’s the memory of those simple meals that makes me long for the hazy days of my childhood. 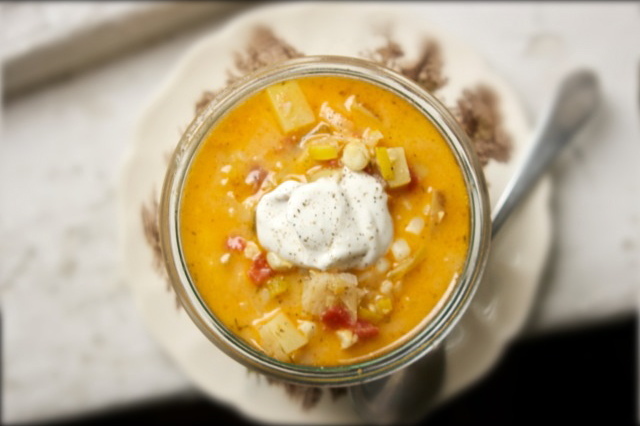 Now that summer is almost gone, it’s time to take all those late-season tomatoes and corn and turn ’em into chowder! I was lucky enough to get a big box of sweet and juicy Maryland corn from my parents recently, so this soup was an extra-special batch. I love the richness that the corn broth adds here, and I love getting to use the cobs as opposed to just throwing them out. Make this soup and keep it around for a few days, it will only get better. It is ideal for leftover lunches whist sitting on stoops wearing sweaters. It may not me a Maryland backyard summer, but it’s pretty grand nonetheless. To make the corn broth, strip kernels from cobs and set aside. 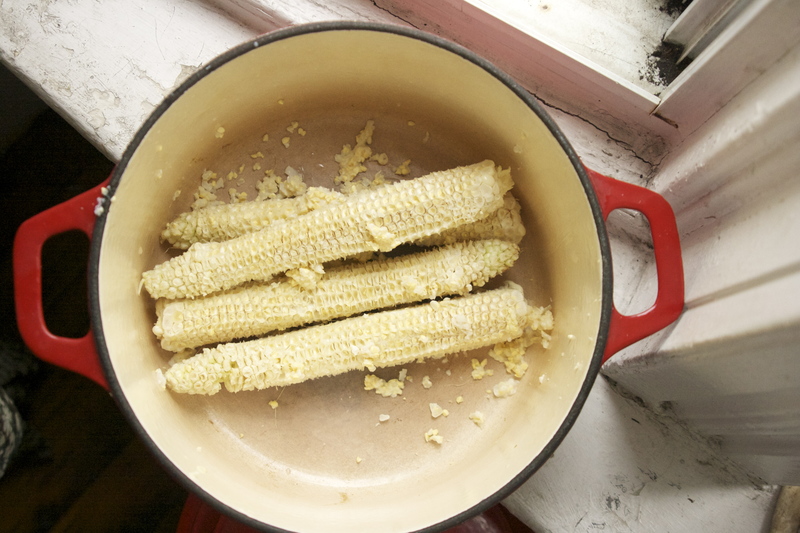 Scrape the bare cobs over a stockpot with the dull side of a paring knife. This will release any extra pieces of kernel as well as the corn’s ‘milk’, which adds lots of flavor and sweetness. Place cobs with scrapings in stockpot and four cups of water. Bring to a boil then reduce heat, cover, and simmer for about thirty minutes. Uncover and continue to simmer to reduce by half. To make the chowder, crisp bacon in a large saucepan. When done, remove and set aside. Cook onion and garlic in rendered bacon fat over medium heat until softened. Add in reserved corn, potatoes, peppers, tomatoes, Old Bay, and thyme. Cook, stirring often, until tomatoes begin to break down. Add in corn broth and bring to a slow boil. 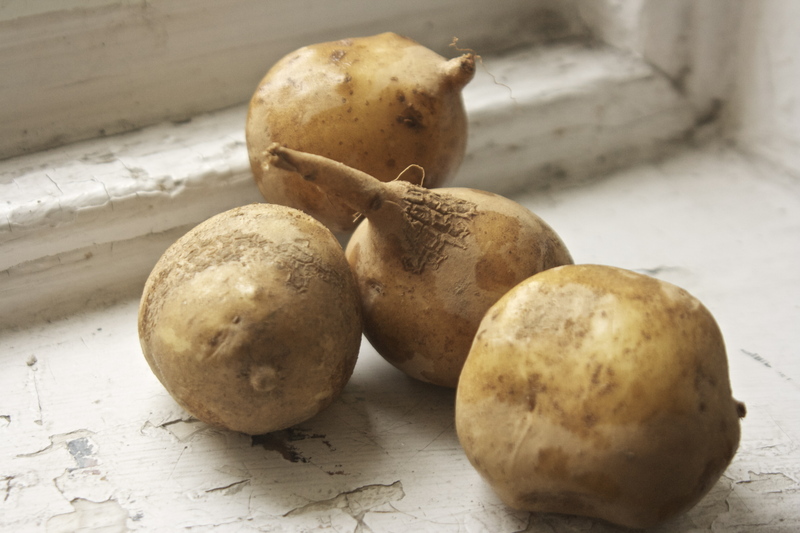 Reduce heat and simmer for about thirty minutes or until potatoes are soft and liquid is mostly absorbed. Add reserved bacon back in. Serve with a dollop of crème fraîche and a freshly cracked black pepper. This sounds divine, and that first photo is killer! totes gonna make this tonight!